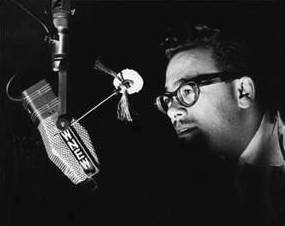 Al “Jazzbo” Collins started broadcasting at WNEW in 1950. Just as Martin Block created the illusion that he was speaking from the “Make Believe Ballroom”, Collins claimed to be broadcasting from a cloud high above the city of New York, the show “Collins-on-the-Cloud” was born. Jazzbo significantly promoted Jazz and, more importantly, often promoted the east coast jazz scene and the respected artist that made up its core. Over the course of the 1950’s there were many challenges from station managers on the type of music to be aired. By the late 1950’s Jazzbo moved on from WNEW and continued his radio career in many east coast and west coast radio stations. With this new imagery also came a new persona, Jazzbo became the little purple elf who lived in the grotto. 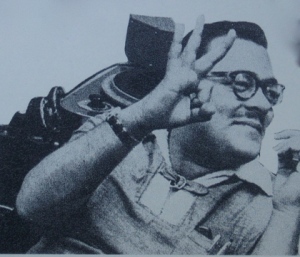 As with his broadcast in the 50’s, Jazzbo actively promoted jazz. On his business card was his motto: you never have too much Basie. Always a character there were many famous stunts by Jazzbo that perpetrated late in the evening on WNEW. On one evening, Jazzbo locked himself up in the studio and played the Chordettes “Mr. Sandman” until six am. At one point the NYPD called the station to see if something was wrong. When not on air, Jazzbo could be found hosting a Count Basie concert making a personal appearance. True to his new persona, Jazzbo would wear a little elf costume and perform one of his famous beatnik nursery stories. The host of “The Milkman’s Matinee” Jazzbo would leave WNEW and go back toSan Francisco to join his family. Jazzbo did one last stint at WNEW when he again rejoined the broadcasting on air team in 1986 till 1990, two years before WNEW went off the air forever. Upon his return in 1986, the first song he played: “Mr. Sandman”.